When I found out that a second Spinelli’s Deli location was opening downtown (50 N. High St.), their delicious food was reason enough for me to go check out the new location. The menu is the same as the menu at their Victorian Village location : breakfast sandwiches, pastries, bagels, salads, soups, hot and cold sandwiches, pizzas and coffee (all served fresh, and catering is available). 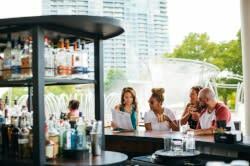 Nestled in the hustle and bustle of downtown Columbus, the new location also features free Wi-Fi, bar-style seating, a patio, a large retractable window facing High Street and an online ordering/pickup system with a separate, dedicated register. Spinelli’s is also offering a reason other than food to visit: Art. The walls of the downtown Spinelli’s restaurant will serve as a gallery space, featuring four local art exhibits a year. The first artist to be featured is Columbus photographer and native, Kojo Kamau . His work is described as "artistic impressions with historical significance." The exhibit will highlight some of Kojo’s signature pieces and will be on display through December 31. Anyone who purchases a photograph will receive a $10 Spinelli’s gift certificate. Both Kojo’s work and Spinelli’s Deli focus on a strong sense of community, and you can check them both out tomorrow night at a grand opening celebration. Stop in on Wednesday, October 27 from 5-8 p.m for great food, great art, and a dose of Columbus community spirit.